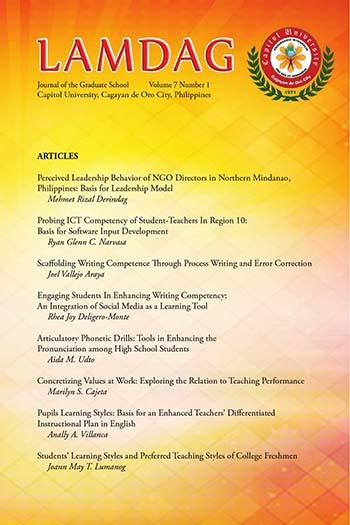 LAMDAG is a fitting concept that captures the intent of the Graduate School journal to serve as an avenue for the publication of Graduate School faculty and students’ academic outputs. The cover design shows bright light from the right corner slowly illuminating the crimson red cover; the official color of Capitol University. At the bottom of the cover is a t’nalak cloth design of the T’boli tribe in South Cotabato. The designs of each t’nalak cloth are revealed in the dreams of the T’boli weavers which they translate in fabric making each design unique to others. In the same way the academic output of each faculty and student is an illumination from concrete experiences that are woven into concepts. These concepts are now printed in this journal hoping it would also illuminate the readers.